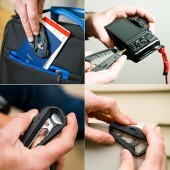 Multitools today have evolved using the same materials and processes that have been used in the past. What they lack is the ability to fit within a contemporary context. We wanted to create a highly portable and adaptable multitool that worked with how we live today and most importantly able to be there when you needed it the most. 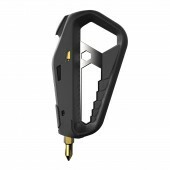 The M100 multitool is a hybrid design bringing the best of materials technology to deliver a compact, ultra lightweight tool that can adapt to your needs and that won't scratch your technology (phone, laptop, etc) when carried. The most effective tool is the one you have on yourself. We designed the M100 with this in mind so that it had a small form, was lightweight and delivered high functionality in a contemporary environment. At only 50g the M100 is extremely lightweight, is TSA compliant for air travel and adaptable to the users needs by the ability to swap out specific hex bits that may be needed for that days outing. Current multitool are made almost entirely of steel, limiting their ability to fit within a contemporary setting. The M100 brings together materials technology through its use of high tech polymer composite with hardened stainless steel. The result is a patented world first design delivering a lightweight multitool with the strength to tackle any challenge. In addition the use of material and manufacturing processes enable an innovative internal storage chamber that provides the user the versatility to adjust the tools they carry to suit their needs. We utilized extensive surveys, observations studies and market research to create the foundation for the project. During the product development we created a test pilot program where approx 100 users all around the world trialed early prototypes and provide much needed feedback. This loop was then closed by involving these test pilots in the final designs. This comprehensive user involvement resulted in a real world tested, robust design that was well received in the marketplace. Developing new ideas are always a challenge. Throughout the creation of the M100 multitool we were met with obstacles from design, materials to manufacturing processes. The biggest challenge however came during the first production run when a number of issues were identified including user related, manufacturing tolerances and real world variations. During this time we involved our users (approx 5K) to provide much needed feedback. The result was the product we see today - user developed, tested and proven. 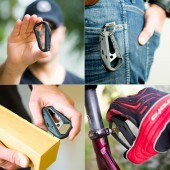 Tacticagear create cool stuff for your everyday adventures. In 2016 the launched a Kickstarter campaign that went on to become the highest funded multitool in crowdfunding history. The are passionate about design, materials and technology and heavily invest in research and development to create original innovations. 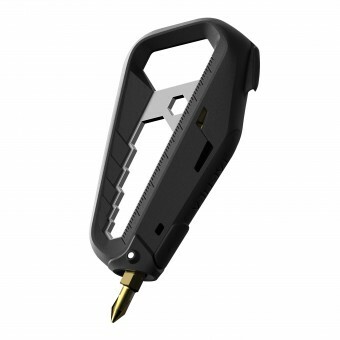 Tactica M100 Multitool by Tacticagear is a Nominee in Hardware, Power and Hand Tools Design Category. · Click here to register today inorder to be able to view the profile and other works by Tacticagear when results are announced. 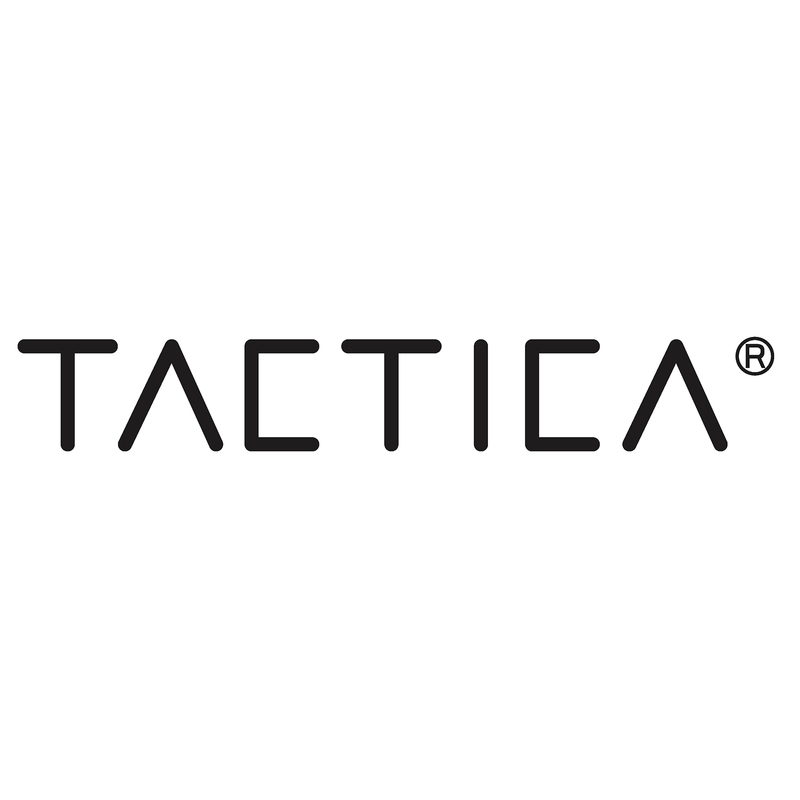 Tactica M100 Multitool by Tacticagear is Winner in Hardware, Power and Hand Tools Design Category, 2017 - 2018. · Press Members: Login or Register to request an exclusive interview with Tacticagear. · Click here to register inorder to view the profile and other works by Tacticagear. 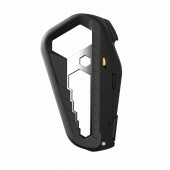 Did you like Tacticagear's Hardware Design? Did you like Tactica M100 Multitool? Help us create a global awareness for good hardware design worldwide. Show your support for Tacticagear, the creator of great hardware design by gifting them a nomination ticket so that we could promote more of their great hardware designs.